The 100 Motor Cars of Radnor Hunt are carefully selected from collections from around the country each chosen for their educational value and aesthetic beauty. The level of detail, preparation, and show-field placement is amazing with a wonderful blend of classic and sports cars. Porsche Cars of Historical Racing Significance was one of the three featured categories this year, the other automotive category being the elegant coachwork of French Coachbuilders. The third honored category was the Triumph and BMW motorcycles. Included were some of the most rare and important examples from all categories. This was the 10th year of the annual event held in the beautiful landscape of Eastern Pennsylvania renowned for its rolling hills and horse pastures. The festivities began on Friday night with a barbeque which included a free panel discussion on the restoration and care of Porsche 356. Guests sipped on the finest brew as they enjoyed live entertainment and breath-taking views from the back porch of Radnor Hunt. On Saturday there was a rally through the historic and pastoral back roads of Chester County, finishing at a local country estate for a fabulous picnic lunch. Later that evening was the Art Show Cocktail Reception featuring the artist and local painter George H. Rothacker. Following the reception was a Black Tie Gala Dinner. The 100 Motor Cars Of Radnor Hunt began early on Sunday morning. The French bodied cars included Roll-Royce, Hispano Suiza, Delahaye, Talbot Lago, Peugeot, Bentley, Stutz and Minerva. The coachwork included such greats as Henri Chapron, Hibbard & Darrin, Letourneur & Marchand, Saoutchik, and Figoni & Falaschi. Two breathtaking Talbot cars with coachwork by Figoni & Falaschi sat next to each other giving the sensation of motion at a stand-still with sweeping pontoon fenders and seating for two. One would assume these to be constructed as rolling works of art rather than designed for sporting competition. The flamboyantly sculptured designs are stunning, graceful, and gorgeous. They personify the builder's appreciation for air-flow and aerodynamics. It is only appropriate that the Talbot-Lago/Darrocq T150 C, which appeared at the Pebble Beach Concours d'Elegance just a few weeks prior where it was awarded the prestigious French Cup, was awarded 'Best in Show' at the Radnor Hunt Concours. From coast-to-coast this vehicle is admired for its unmatched beauty and stunning elegance. The Porsche field included many famous road and racing cars from this fabled marque. The 'Best Porsche' award went to the 1963 Porsche 901 Prototype 911. The Porsche 901, designed by Ferri 'Butsi' Porsche, was the first 'new' vehicle Porsche had ever produced. Prior to this was the 356 series. The name '901' would not last since it infringed on Peugoet's claim to the name, so the vehicle was designated 911 a year later. As a result, only a few Porsches bore the 901 name. The example shown was one of the first 901's constructed by Porsche and there are details that only it possesses. It is the oldest remaining 911 and one of four factory prototypes constructed. The company used it for testing designs and placements of components resulting in a unique car with a one-of-a-kind instrumentation cluster. Looking over the Porsche show field, one saw the significant cars that played an integral role in the company's production history. Sitting next to these vehicles were their racing counterparts that brought world recognition and accomplishment to the company. On the world's toughest stages and against the fiercest competition the Porsche marque has often crossed the finish line first. Their accomplishments were honored at the Radnor Concours with a carefully selected few on display, each to be admired and appreciated for the roles they have played. All of the cars on display have been restored to their original with some vehicles looking better than new. Other than the featured categories, the rest of the show field spanned the many years of automotive history and encompassed both luxury and sport. The most senior automobile in attendance was a 1906 REO Runabout. Excluding the Porsche vehicles, the newest vehicle was the 1970 TVR Vixen S2, which was the runner-up for the Closed Sports Car Category. The visually and mechanically appealing Marmon 16 Sports Coupe, named for its sixteen-cylinder engine, was awarded first in the American Classic Category. The Alvis Speed 25 Tourer was awarded first in the Pre-War Sports Car category while top honors in the Historic Race Category went to the Ferrari 750 Monza. The 1911 Hart-Kraft Light Delivery Truck was awarded first in the Veteran 1st category. The Open Sports Car award went to the Mercedes-Benz 300SL Roadster while the Closed Sports Car award went to the Chevrolet Corvette Split Window Coupe. 1896 Spiral Motorcycle was the oldest piece of machinery on display and was the winner of the Unrestored/Veteran award in the Motorcycle category. These are but a few of the award winners from the event. A few of the judges are from the automotive community but this is not a strict requirement. The judging panel is made up of a wide range of professionals capable of performing the task at hand. The judging is basically a beauty competition focusing on many key aspects and components of the vehicle. The judges' time is not spent studying each nut and bolt for proper alignment or correctness, this is left up to the club judging. 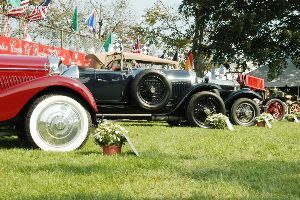 If the vehicle has been invited to the Concours, it is already considered the most exquisite vehicle amongst its peers. What the judges focus on is the beauty and visual impact of the vehicle. The design and quality of construction is taken into consideration and how it correlates to its era. The interpretation of beauty, purpose, character, and elegance is analyzed with the tastes and intentions of the builder taken into consideration. Ultimately, the vehicle that scores the most points is the one that makes the hairs on the back of your neck stand up, makes your heart beat faster, freezes time, and trumps your wildest imagination or dreams. Half of the judging does rely on a point system which is separated into five categories totaling 20 possible point values. This allows for a comparison of apples-to-apples. The Radnor Hunt Concours is both exclusive and intimate focusing on quality rather than quantity. The spacious show field allows for adequate room for each of the 100 Motor Cars while the horse field and equestrian center provide a pleasant and tranquil backdrop. There are very few concourses or events that could rival the exclusivity or detail of the Radnor Hunt Concours. All of the weekend's festivities are for the benefit of the Thorncroft and Willistown Conservation Trust. The mission of the Willistown Conservation Trust is to preserve the open land, rural character, scenic, historic, and ecologically significant resources of the Willistown area and nearby communities. Thorncroft is a nationally recognized equestrian center whose mission is to help build the physical, emotional and mental well-being of all people – particularly those with special needs – through the close interaction, love and care of horses. Like with writing about most shows, we have to mention the weather. The dreaded flooding during hurricane season is always a concern when we venture out to an event. But this weekend ended up being fantastic weather. Even the long drive was enjoyable to say the least. After arriving at the start of the show, we walked around to get a feel for what was to offer. Polite people, beautiful scenery, and exotic cars were first to greet us. We walked in through the new car section, which showed off the moderately priced to the vehicles you dream you could afford. After photographing the Triumph and BMW motorcycles and observing some of the old and new designs of those two-wheeled masterpieces, we entered the main show field and felt immediately drawn to the popular 'Delahayes'. These teardrop beauties pulled us in with their flowing designs and with the exquisite attention of French detail. Our day continued with the show's presenter, Porsche. Porsche's of all types were lined up along the stair-stepping landscape. Many from the 50's on up to 05' were brought to Radnor. If you finished with looking at all of the vehicles, you were able to enjoy the inside art gallery. Filled with paintings that presented a different view of your favorite classic car. Also, located near the main show field, were vendors promoting their new cars, racecars, and products.